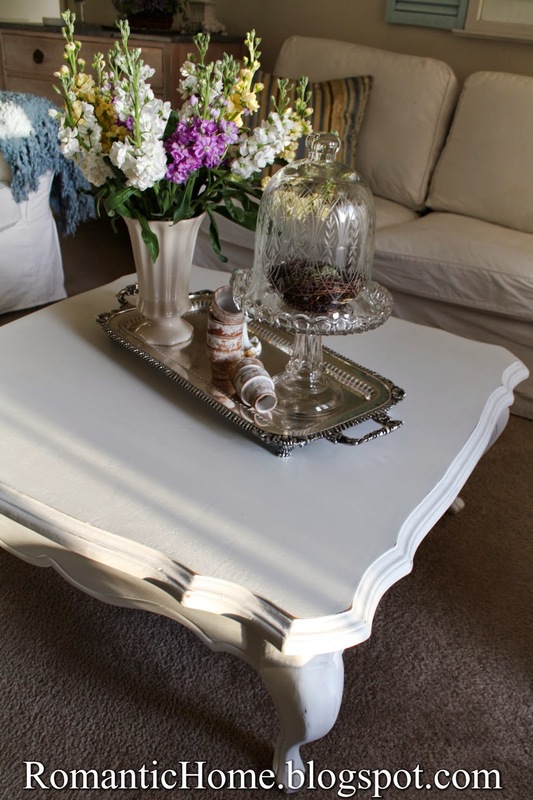 I finally repainted my coffee table! I've been talking about it for years but after all the furniture I painted in the past I was dreading it! This time it was a breeze because I used Annie Sloan Chalk Paint! Now I know why everyone raves about this paint! It is AMAZING! 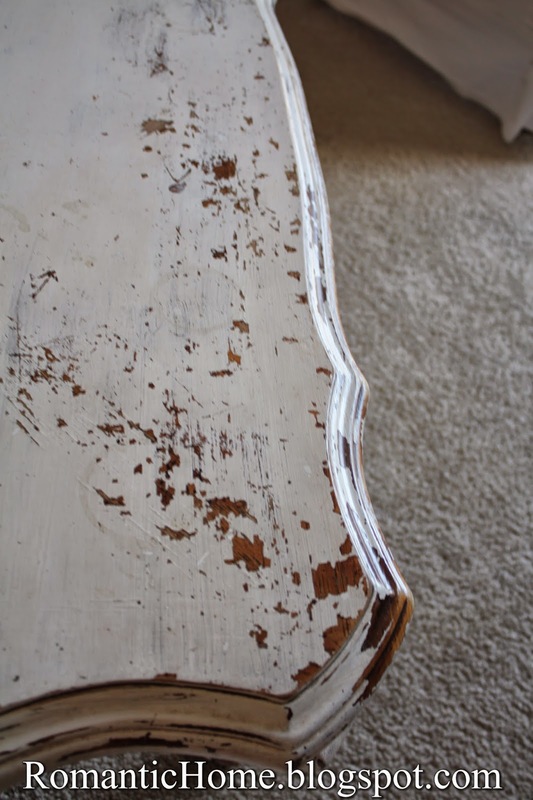 I didn't have to strip or sand I just painted it and then used the Annie Sloan wax on top! 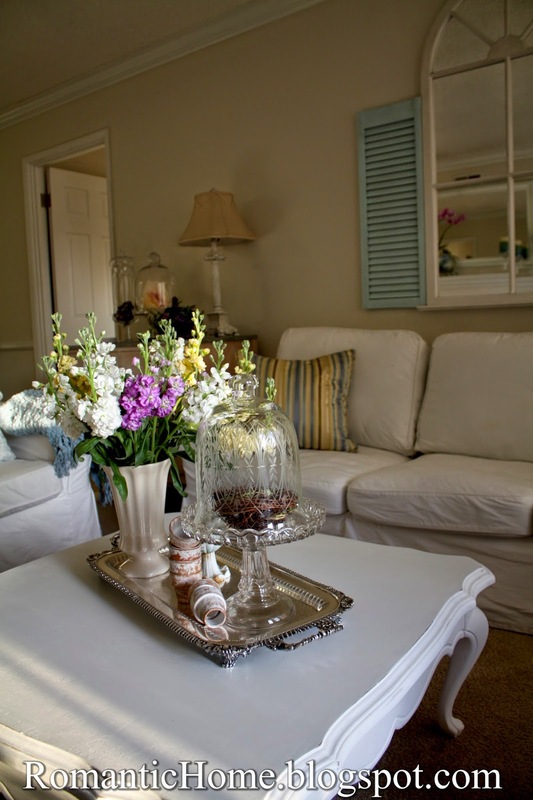 Now I want to repaint almost all my furniture! Please excuse the wrinkled slipcovers on my sofa. I just changed them and it takes a few days for the wrinkles to release! And those dark spots on the table are just shadows. I distressed the table a little but not as much as I usually do. Now that I had a freshly painted table I had to decorate it! 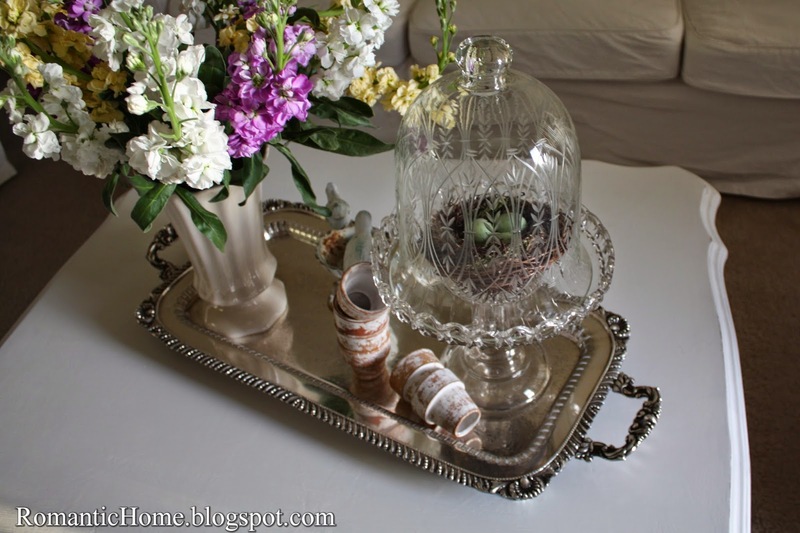 I used my big silver tray and added some Spring items. Those little terracotta pots are actually napkin rings. 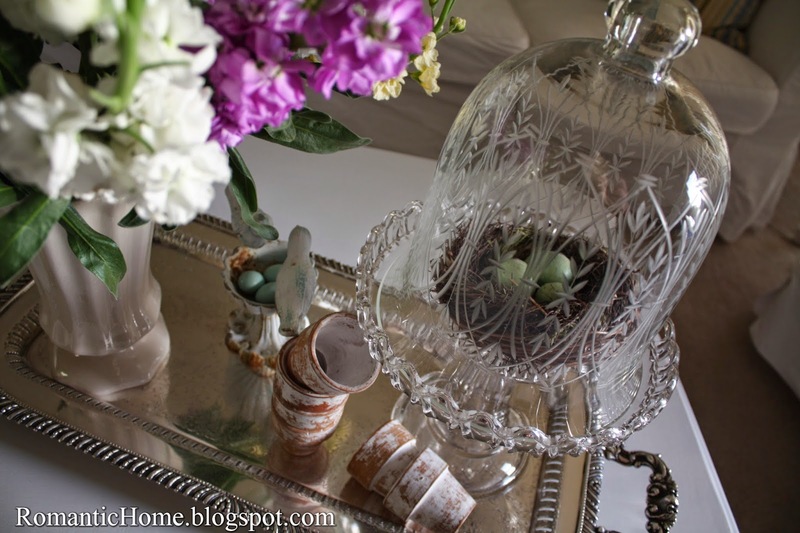 I bought the etched cloche at Marshalls years ago. The flowers are from the grocery store. I love the scent of stock but it is strong at times! Okay...so this is why I had to repaint the coffee table. I'm really embarrassed to share this because it is so bad! It was the first piece of furniture I ever painted. That was over 15 years ago! It was in really bad shape because I didn't strip it, I just sanded it and I thought that was good enough. Well it would have been if I would have known about Annie Sloan Chalk Paint back then! It wasn't shabby chic it was just shabby as you can see! It looks so much fresher now! I'm so happy I finally repainted it! If you are joining in on Show and Tell Friday, please remember that your Show and Tell needs to be something from your home or garden . If you would like to join in, please enter your name and leave your exact Show and Tell blog post link, not just your blog link and as a common courtesy link back to my blog. Beautiful job on the table Cindy - I only use Annie Sloan's paints - makes painting ridiculously easy LOL ! Love how you decorated it too ! 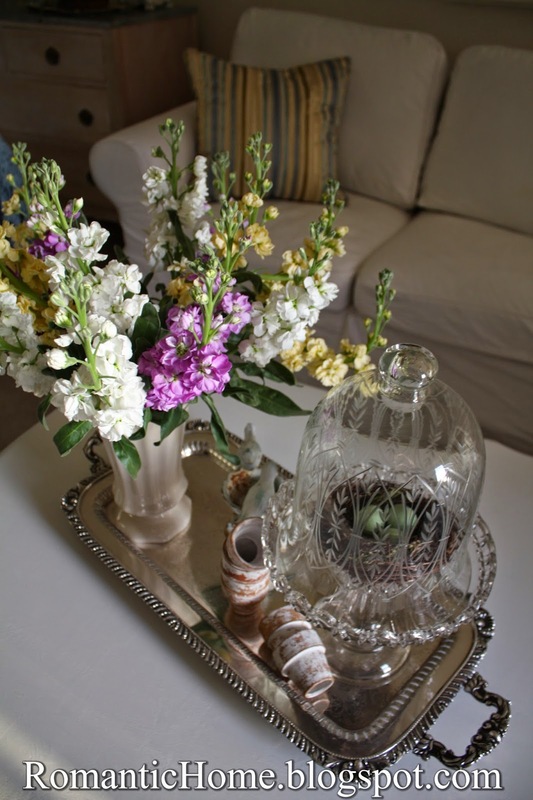 Your table looks great and the silver tray with all the Spring pretties looks wonderful too! 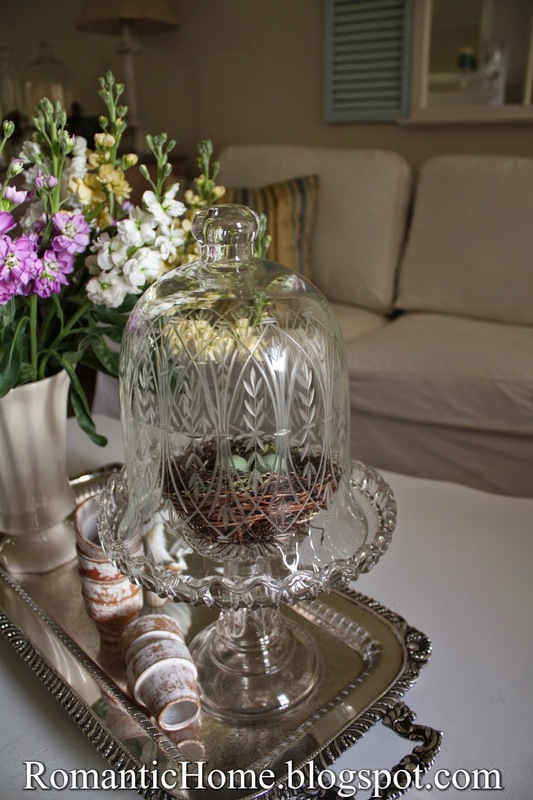 I have never seen an etched cloche, how beautiful! 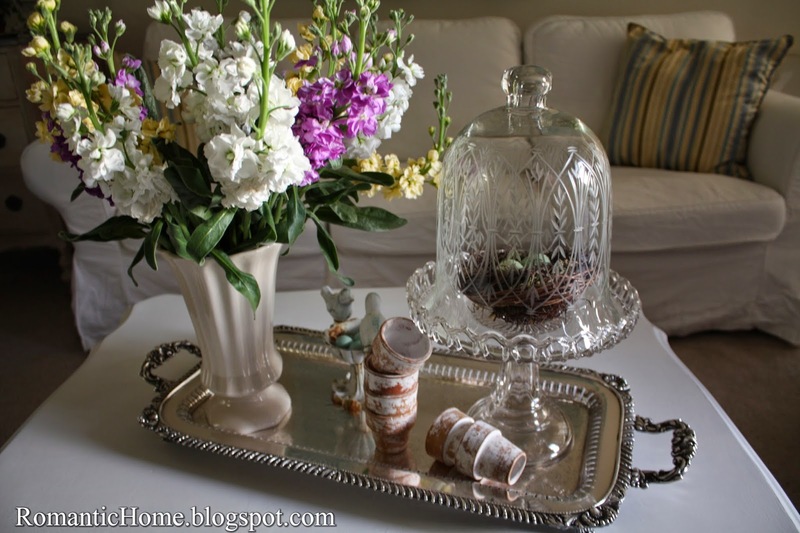 Pretty table and vignette on your tray. Thanks for hosting! 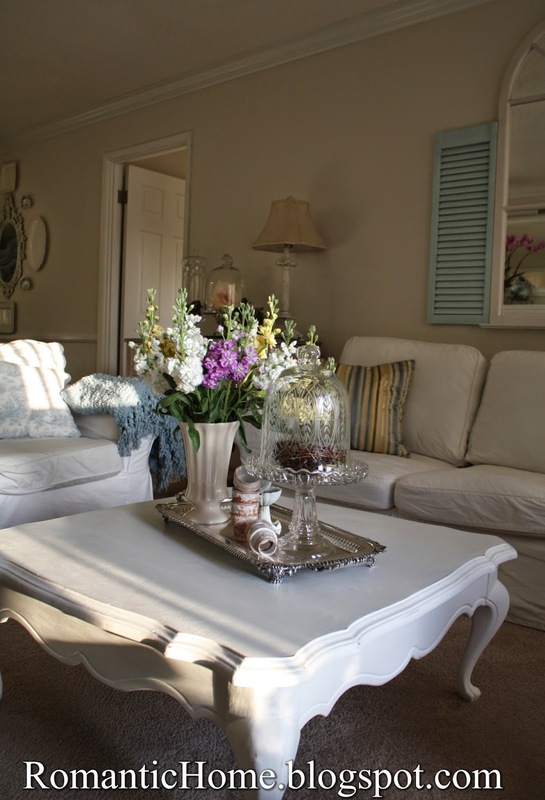 Love the white table painted! 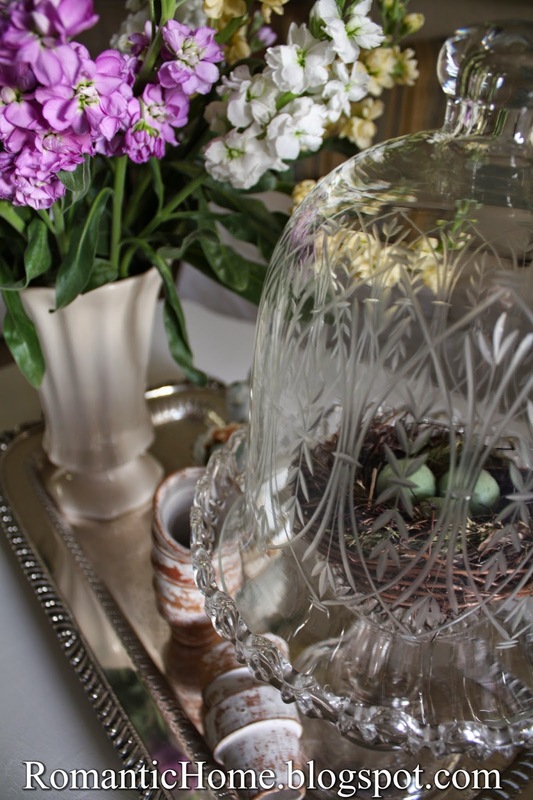 The cloche on the lovely tray is to die for!!! 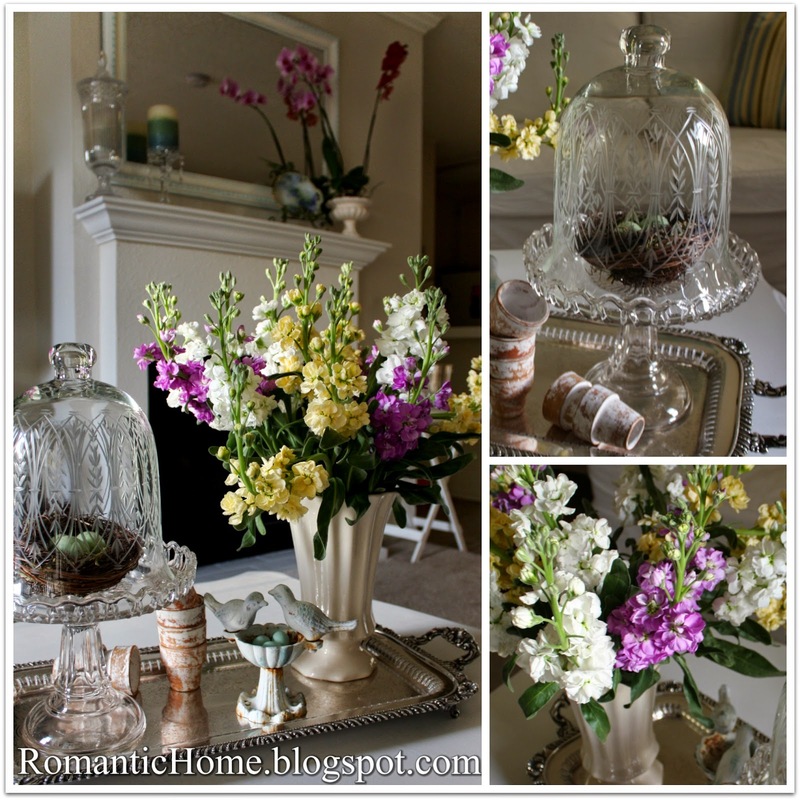 Cindy, I love how your table turned out...and I always enjoy visiting your blog. Thank you Cindy for hosting Show and Tell Friday. 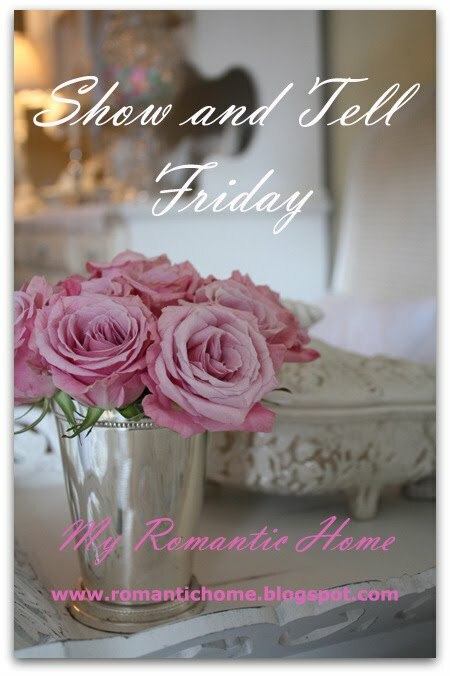 I enjoyed seeing your home decorations, visual treats. 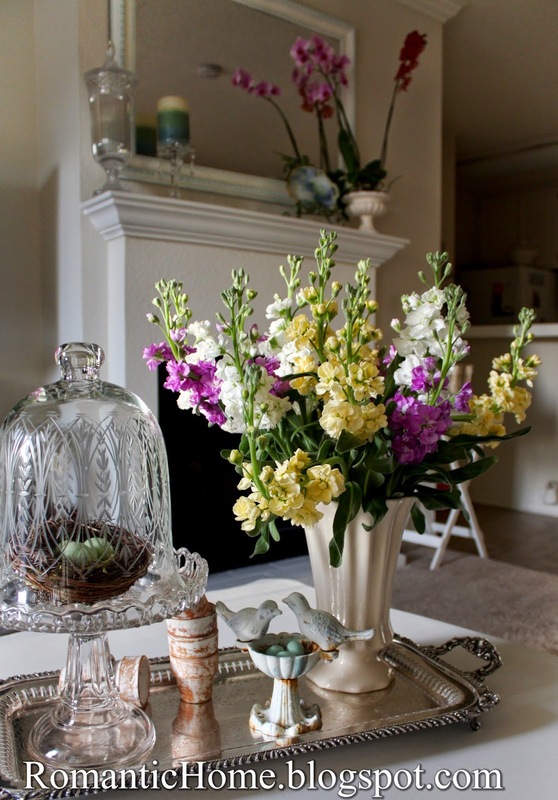 Your table looks beautiful and oh my, I'm crazy about your lovely vignette! Thanks for hosting! Your coffee table looks great! I love it! Great job on the table Cindy! Thanks for the party! Your table looks great. 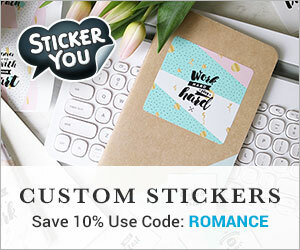 I have been using Annie Sloan over 2 years. Indoor and outdoor furniture. Varnish outside. Your cloche is the prettiest cloche I have seen on the Internet. We have a Marshall's and getting a Homegoods. I will be watching. Love the table...what color ASCP did you use?